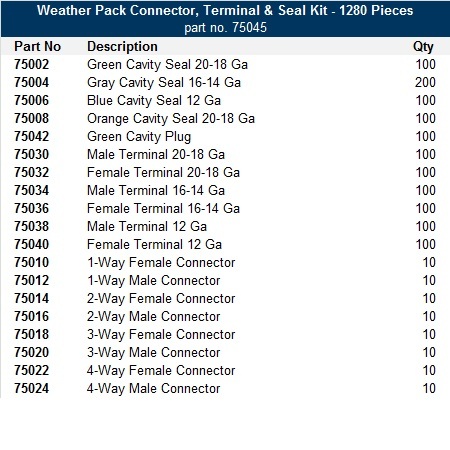 The Weather Pack kit contains all of the essential connectors you need to make a quality weather-resistant connection over and over again. Ideal for large or multiple projects that require Weather Pack wire connections. Everything you need to make a quality weather-resistant connection over and over again. A whopping assortment of 1,280 total pieces, including terminals, seals and housings. All within a rugged, gray metal scoop box (18" x 12" x 3").